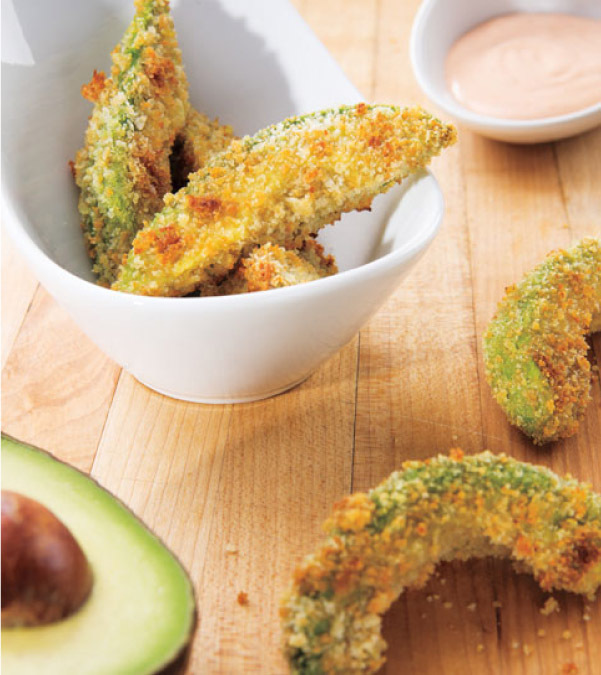 1.Prepare Avocado Fries: Preheat oven to 425°F. Spray large rimmed baking pan with nonstick cooking spray. In pie plate or wide, shallow dish, combine breadcrumbs, onion powder and salt. In second pie plate or wide, shallow bowl, whisk egg whites until frothy. 2.Dip avocados in egg whites, allowing excess to drip off, then press lightly into breadcrumb mixture so crumbs adhere; transfer to prepared pan. Spray avocado fries with cooking spray. Bake 18 to 20 minutes or until golden brown. 3.Meanwhile, prepare Sriracha Dip: In small bowl, stir mayonnaise, Sriracha and mustard until well combined. Makes about 3/4 cup. Serve fries hot with dip. > Sprinkle hot fries with additional salt to taste.